McDonald’s says it, along with local franchise operators, will invest $19 million in D.C. throughout this year and 2019 on the construction and modernization of 15 restaurants, both inside and outside. WASHINGTON — Hoping to claw back fast-food market share, McDonald’s and its franchisees are investing $6 billion to modernize most of its U.S. restaurants by 2020, including many in the D.C. area. McDonald’s said Tuesday that it, along with local franchise operators, will invest $19 million in D.C. throughout this year and 2019 on the construction and modernization of 15 restaurants, both inside and outside. Updates include redesigned dining rooms and updated exteriors, digital self-order kiosks, remodeled counters to allow for table service, new digital menu boards inside at drive-thrus, designated parking spots for curbside pickup through its mobile app and expanded McCafé counters with larger display cases. Last year, McDonald’s picked the D.C. area for its first big rollout of mobile app ordering. It was the fast food giant’s largest mobile rollout outside of a handful of test markets on the West Coast. McDonald’s mobile order-and-pay system uses geofencing technology for check-in, meaning McDonald’s can determine when customers are nearby and make sure their food is prepared and ready at the correct time. 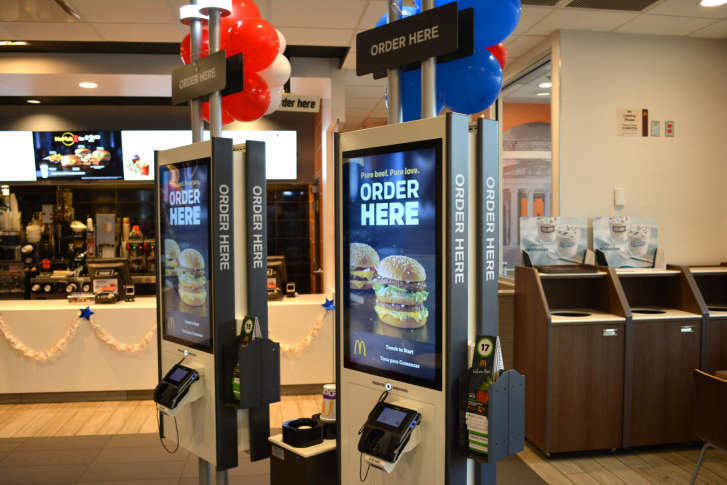 D.C. was also one of the first markets for McDonald’s to start rolling out kiosk ordering and table service. While McDonald’s is facing headwinds from competition in the fiercely competitive fast food segment, its same-store sales rose 2.6 percent in the second quarter. It also revamped its Dollar Menu earlier this year, with $1, $2 and $3-priced items.